I was chatting with a friend the other day about problems that they were having in their garden, when this topic came up: What do you do when something is munching a plant in your garden? It is not a bug. It is not something large, like deer, elk, moose, or even antelope, or something more obvious like a woodchuck or rabbit, and you have tried unsuccessfully to fence it out. You may not even be sure of who the culprit is, which means that it is likely a type of small to midsized rodent (squirrels, chipmunks, rats or mice). Or, in the case of plants like cat mint (catnip) it just might be the neighborhood kitties. Well, I had exactly this problem in my own garden this summer. 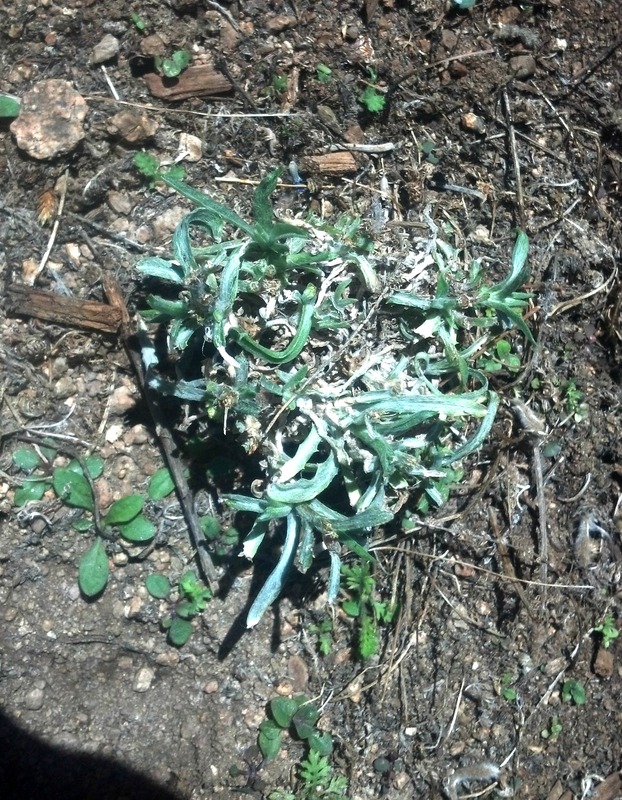 A single pot with a bachelor button in the middle – growing well and waiting for me to plant more seeds, when CHOMP. I came out one morning to find most of the bachelor button GONE. Now there is nothing like this sort of event to put a dedicated gardener on the warpath, but I had already been mending fences, and watching closely for daytime marauders. I knew that my best bet was to simply put up a barricade, and it had to be a good one. Now, for those of you who do not know, I live on a “ranch” – a 43 acre piece of mostly undeveloped land on a barely maintained dirt road in Northern Arizona. So I knew that I had the tools to do this project. But don’t let this fact scare you away – I have seen my mother-in-law, who lives on a lovely tree bedecked side street in a town in Maine, do essentially the same thing to save her cat mint from marauding neighboring kitties. If “grandma” can do it, so can you! I scrounged up an assortment of left over hardware cloth, chicken wire, and baling wire for my project. When you live on a ranch you try to always have these sort of materials on hand, and many suburban gardeners do, too. One of the questions that you need to ask yourself is “how permanent is this solution going to be?” Does it need to last a couple of weeks (just long enough for the plant to get a “head start” on the critters), or the season (the critters will be there for the rest of the season), or several seasons (I will need it again next year). After living and gardening in this area for about eight years I usually try to make as many solutions be permanent as possible. The critters will be back next year. If I were buying new materials I would purchase a roll of hardware cloth (probably 18 or 24 inches wide/tall), a roll of chicken wire, and a roll of baling wire. So let’s discuss the differences and why I made these choices. Hardware cloth is a welded wire “fabric”. The holes in the hardware cloth are all the same size, and square. Hardware cloth is sold with holes in an assortment of sizes – I prefer 1/2 inch because it will keep out the vast majority of my pests, but allow all but the largest lizards to go through to eat bugs. Hardware cloth is stiffer than chicken wire and has a lot of structural stability. It can be curved into arches and circles, and creased to create moderately sturdy square structures. Chicken wire has six sided holes. They can vary in size, depending on the brand, but they are generally about 1 inch across. The wire is thinner and less sturdy than hardware cloth. The wire is not welded, it is twisted together to form the six sided shapes. Chicken wire can be curved into arches and circles. It is difficult to crease into square structures and it crushes much more easily than hardware cloth. Baling wire is the wire, which comes in rolls, that was traditionally used to bale hay. Most modern hay balers now use some sort of synthetic twine. Baling wire is a soft iron wire that is useful for repairing lots of things. It will rust.